I apologize for being so behind on posting our toddler cooking projects! With snow days and hubby travels, I lost track of a lot of things. This week’s recipe is actually what we made the week before Valentine’s day. 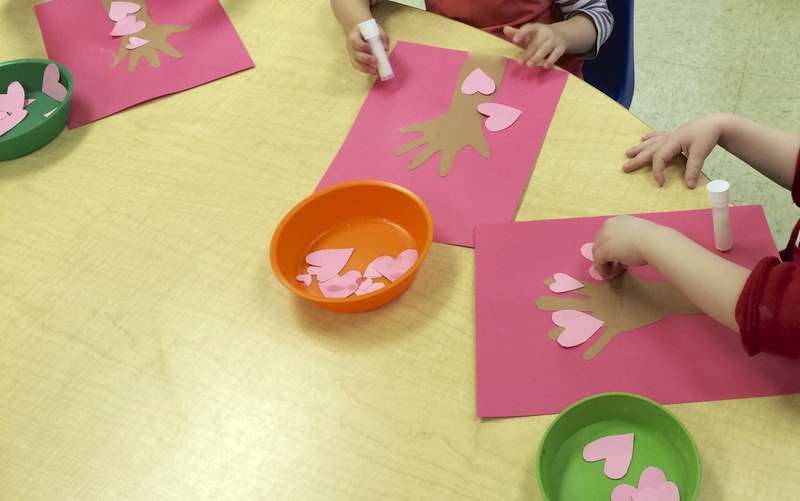 Since we alternate cooking days between Thursdays and Fridays each week, I wanted this group to make a special Valentine snack as well, even though we were a week early. It turned out to be a good thing because Valentine’s Day was a snow day so we didn’t get a chance to make anything else anyway. We had chocolate chips left from the holidays (thanks to a generous mom from our group!) so I figured it would be a great time to use them. I found a healthier strawberry-chocolate muffin recipe to try to off-set the fact that we would use chocolate chips. With each recipe, I try to find a few special tasks for the children. Sometimes, it may be to crack eggs or chop something. 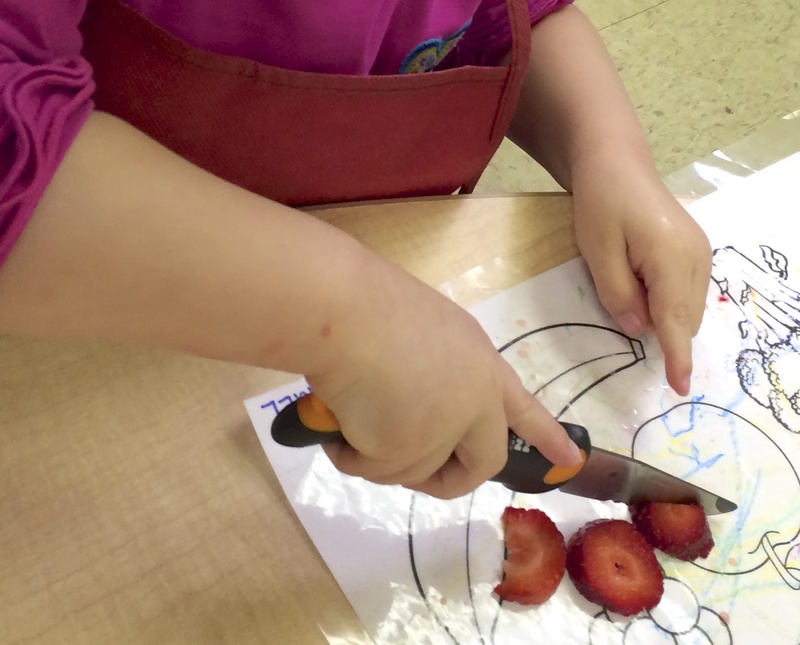 For this muffin recipe, I gave each child a plastic knife and a strawberry and asked them to chop it. I told them we would add them to the muffin mixture. It started out great! We were so impressed to see how focus they all worked, trying so hard to dice their strawberries. Unfortunately for the baking, most of them couldn’t resist and ate their strawberries as soon as they were done chopping them. Out of twelve toddlers, only two waited and gave us their chopped strawberries. Thankfully, we had extra and, as soon as we noticed their habit, we quickly chopped extra ones for the recipe. Using one of our child-safe knives, a generous donation from a class parent. Another interesting aspect of making a healthier muffin recipe was using applesauce instead of butter. We had extra individual serving sizes of applesauce from past snack time and the children really loved seeing their favorite snack thrown into the recipe. And surprisingly enough (not! ), the children were very happy to sample the chocolate chips before adding them to the recipe! Needless to say, it was a love-filled week in the toddler class!